Bloodshed due to a trauma such as homicide or suicide is a horrific experience for anyone involved, especially family members who must deal with the reality that their loved one has passed in such a tragic manner. The last thing they want to worry about is contracting a disease due to bodily fluids left behind at the scene. That’s why it’s so important to immediately contact a certified biohazard team to handle the blood cleanup. 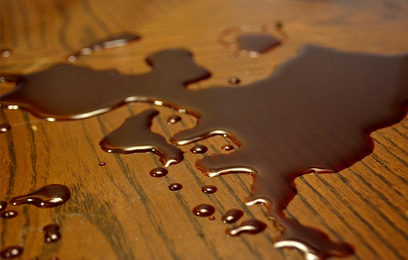 Blood spill incidents present safety risks that can cause disease epidemics if they are not cleaned properly. The experts at Clean Keepers of SWFL Biohazard Cleaning Services in Fort Myers concentrate on restoring properties safely, ensuring that they are free of infectious diseases and blood-borne pathogens. Our licensed specialists follow OSHA’s strict guidelines for blood cleanup and disposal of contaminated materials. Do You Need Professional Blood Cleanup? Psychological Trauma: Seeing large amounts of blood can be traumatic, especially when it is the result of a homicide or suicide. Property Damage: Quick, effective removal of blood is often required to prevent additional property damage. 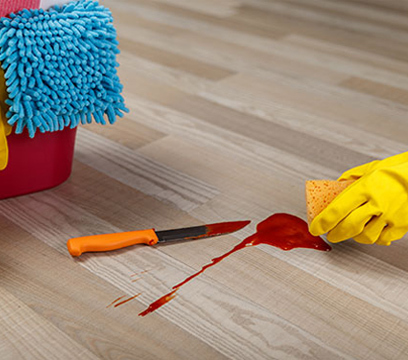 Blood can permeate the floors, resulting in further damage to the dwelling, which only adds to the trauma as you will need to take additional, costly steps to restore your home or office. Don’t expose yourself to the physical and emotional risks of blood cleanup. 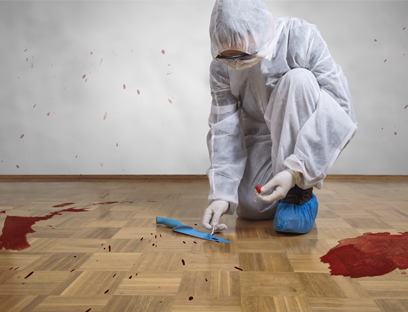 Let the experts at Clean Keepers perform the blood cleanup utilizing hospital-grade chemicals and OSHA-approved procedures to restore your property. It’s important to remember that bodily fluids can spread infectious diseases like AIDs or hepatitis, so it’s crucial to ensure that all blood is cleaned up and the area is professionally sanitized. Unfortunately, accidents and deaths do occur in the workplace. In these cases, management should treat all blood as infectious and immediately remove employees from the area to eliminate contact with blood or other bodily fluids. Should a homicide or suicide occur, once the authorities have been contacted and the scene is cleared, contact a professional blood cleanup company to clean, sanitize, and restore the premises before allowing employees to return to work. Following a work-related accident or death, your staff is likely to be concerned about their safety and the risk of returning to the office where the incident occurred. By contracting a professional blood cleanup service, you are providing your employees with the peace of mind needed to return to work and move on from the unpleasant episode. A homicide or suicide that occurs in a private residence leaves behind startled, upset family members who simply don’t know what to do next. It is important for a proper cleanup to occur before family members return to the home. The aftermath of such a tragic event can be devastating for loved ones. Not only must they try to make sense of the tragedy, but the dwelling is left with blood and other bodily fluids, as well as fingerprint dust used during the investigation process. A biohazard cleanup service can properly clean and sanitize the property according to OSHA’s standards, so that the family may return home to grieve privately for their loved one without the extra worry of issues associated with blood contamination. The highly-qualified staff at Clean Keepers of SWFL Biohazard Cleaning Services employs proper blood cleanup procedures while adhering to state and federal mandates for disposing of biohazardous materials. Call Clean Keepers of SWFL Biohazard Cleaning Services at (239)368-1219 for assistance with blood cleanup. We are available 24/7 to assist you in your time of need.